How early to start music instruction? How early should music lessons start? Even if the child cannot speak yet, it will let their parents know that he or she loves music: the child is pointing to instruments or the tape recorder, starts to dance when music is being played, or is mesmerized by the sight of a musician playing. It is practically impossible to restrain any child from wanting to experiment with making sounds from a drum or piano! As a music teacher, I am always excited when parents inquire about music lessons for a very young child. It demonstrates they want to give their little one the best possible start. Research has shown many benefits from early music education – besides the obvious musical benefits, it fosters brain development, helps them do better in subjects such as math, and nourishes their creativity. Since music is a language, it also enhances social and emotional competence. And, as we all know, some children are able to do amazing things at a very early age, given the exposure to music. So in my view, the earlier, the better! It is not necessary for a child to know letters and numbers in order to benefit from music instruction. Music making at pre school age should start through doing, rather than theoretical excurses. Young children learn best through imitation, rather than through talking about something, or explaning. They come up with the relevant questions soon enough. Naturally, the child will ask questions that lead into the teaching of note names, notation and music theory, when appropriate. So, private lessons at a very young age are great. That said, however, private lessons are sometimes not the best place to start. It is common that the child is unable to focus, gets distracted by too many stimuli in the music room, is unable to be away from the care giver for the duration of a private lesson or the like. That way, music lessons can easily turn into ‘expensive babysitting’. For children younger than three, group classes, such as Music Together, are a great choice. These classes actively involve the parent. The time spent together exploring drums, singing, dancing is appreciated as a precious bonding experience by the parent and child alike, as well as provides a great primer for musical activity. Once three, the child is usually able to attend group classes without the parent present. The ORFF Schulwerk method is a time tested method utilizing pitched and unpitched percussion, the recorder, singing and dancing. The child learns to be part of a group – at times as a soloist, at times as a vital part of the accompaniment. This improves self esteem and social skills. Learning simple scales and rhythms lays a great musical foundation. Once six or seven, private lessons can usually be started without a problem. 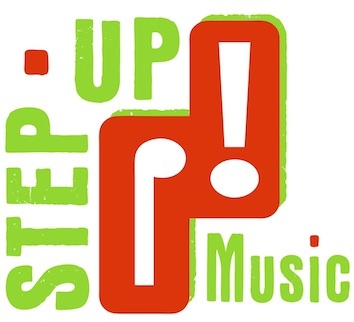 At Step Up Music Vallejo, we are very happy to cater to any age. We offer various levels of our Little Muffin Music Classes, including for little ones as young as two years old. If we get a request for private lessons for children younger than six, we meet with the child to assess his or her abilities to follow directions, be away from Mommy and the like. Sometimes we try it for a month and then reassess whether group lessons aren’t perhaps a better choice. If they are, it doesn’t mean anything about your child’s musical (or other!) talent, it just means that the group class constitutes a better learning environment at that particular time in the child’s development. Sometimes group classes are added in addition to private lessons, with great success. In a nutshell - the earlier the better! What is the best way varies from child to child and will need to be assessed in a meeting or interview.